Why choose Avaza as a MYOB alternative? Looking for more than just invoicing and bookkeeping for your growing business? Avaza is a better fit for the integrated business management. MYOB offers invoicing and bookkeeping features for businesses looking for accounting software. Avaza adds more to your business by adding timesheets, time tracking, quotes & project management into the same software. Let’s take a look at the two side-by-side. All registered trademarks, company names and brand names used on this website are the property of their respective owners. Data on features are taken directly from related web sites and marketing materials as of May, 2016. Information and features are subject to change. To report corrections, please contact us. We’re saving a lot of time by using Avaza. We bill our clients, punch time in on projects, and even create tasks on the go using the mobile app. It’s perfect for our team! 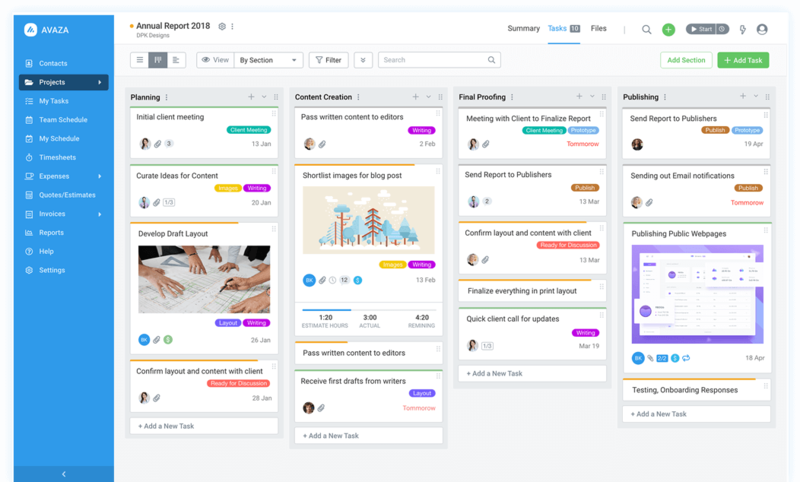 Optimize your workflow with beautiful Kanban boards. Filter by status, team member, due date or tags. Drag and drop tasks across your workflow, and get more done every day. Add team members to projects, and instantly bring them into the loop. Collaborate with them by adding comments and files to tasks easily. Track your project budget and expenses in real-time. Maintain tight control over how your team members spend their time. Access timesheet approvals, combined with productivity reports to help you improve team performance. Simple yet powerful expense approval workflows provide control and insight into your team’s expenses. Receive email notifications when your team submits expenses for approval. Approve expenses in bulk or individually in no time.